Earlier this year, both Genesys and Interactive Intelligence shook the market up by announcing their move to combine forces. That was back during the summer, and as the year comes to an end, so has the acquisition process. 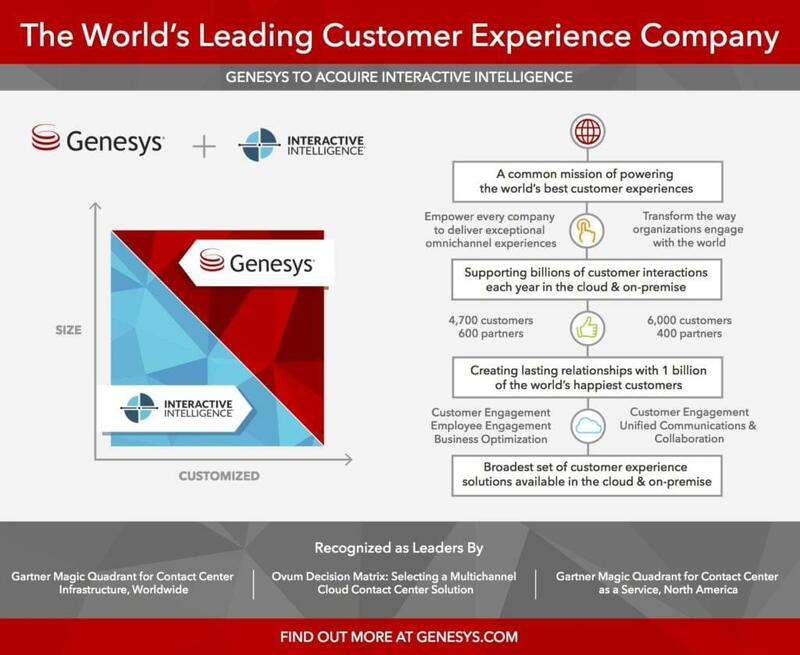 As of December 1, 2016, Genesys now owns Interactive Intelligence and all of its solutions. BWith possibly the largest acquisition in this space completed, we have started to finally hear from Genesys as the dust settles. So far, Genesys has made it clear they will continue to support both company’s existing solutions. Support, sales and training for Interactive Intelligence products will still be underway – just as Genesys products aren’t seeing any slowdown. 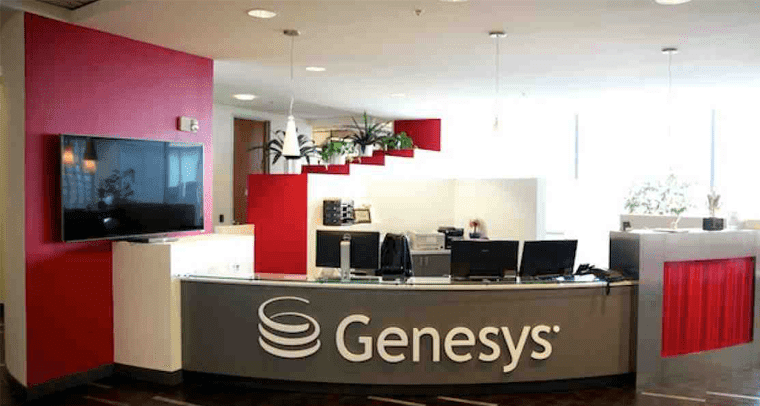 However, while there is still a beating heart at Interactive Intelligence, the company is no longer being listed or traded publicly as they are a part of the Genesys brand. Both Interactive Intelligence and Genesys are well known Five 9 Alternatives, so the market will look a little different in the time to come. While we might have to wait a bit to see exactly what the provider has up its sleeves, we do have some information from Genesys themselves. With the initial promises to combine complimentary solutions, we can start to put together an idea of what we might be able to expect from the newly formed Giant after the turn of the New Year. Genesys has put out a press release announcing the closing of the acquisition, as well as a letter to customers and partners to help resolve some of the mystery behind this move. 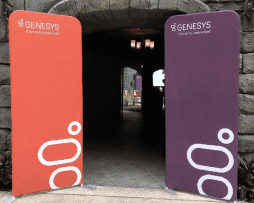 While we cannot say for certain just yet what we can expect from Genesys in the future, CEO Paul Segre has made it clear that solutions from both companies will be coming together. 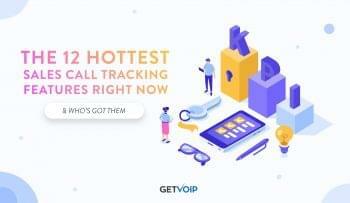 Both companies were big names in the Contact Center and Customer Engagement industry, although recognized for different sides of the same coin. Known for their high-end solutions, Genesys has developed their products to fit the complex needs of Enterprise level contact center. Meanwhile, on the other end of the spectrum Interactive Intelligence is more recognized for what can be considered “out of the box” solutions, geared towards customers of any size. 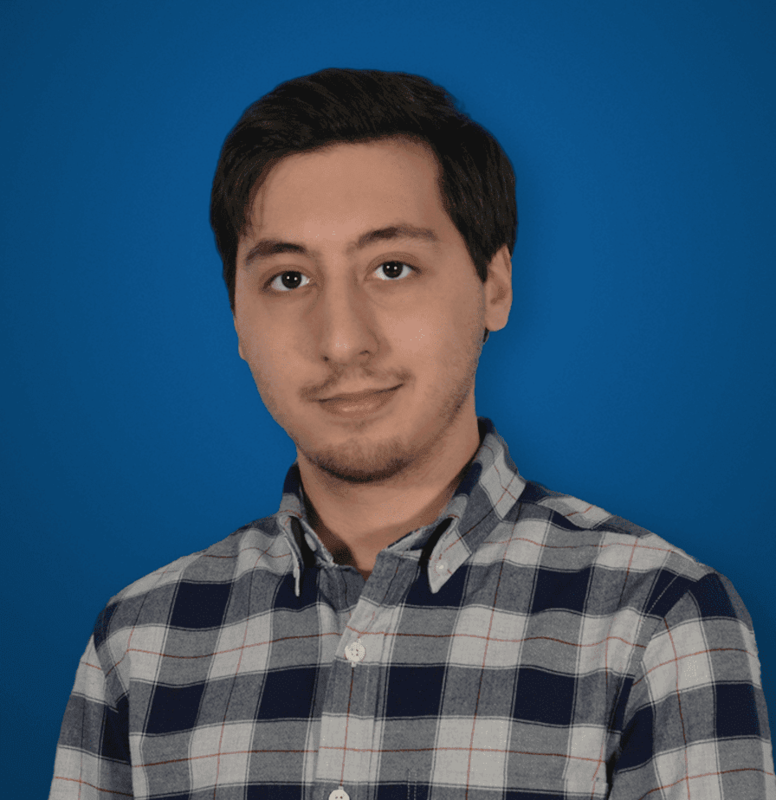 They also offer one of the more transparent pricing structures in the contact center market. 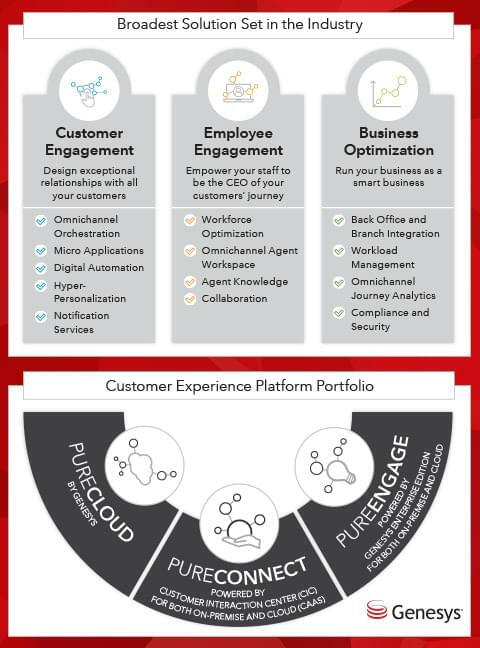 Interactive Intelligence had done a strong job of putting together both Customer Engagement and Unified Communications portfolios – solutions that offered simplicity yet robust platforms for small, to large sized companies. And of course, Genesys took note. On the flip side, we could see Interactive Intelligence’s otherwise “out-of-the-box” solutions could become for flexible, and be adapted to work for large scale Enterprise teams. Of course, we could speculate the potential outcome all day long, yet still manage to miss the mark by a mile. So, to keep things rooted in reality, it’s important to take a look at the information we do have at our disposal, the new information Geneys’s has put out since the closing of the acquisition, and the words from those involved themselves. The nitty gritty details are still vague, but Genesys did outline where they are currently at, and some rough ideas for where they plan to be in the near future, starting with 2017. While not a UC player directly, it will be curious to watch how Genesys innovates compared to some of the biggest UC trends we’ll expect from 2017. Paul Serge will continue to serve as CEO, and Genesys will maintain its headquarters in Daly City, California. Genesys also made it clear that business will continue as usual for Genesys partners, and existing partner and customer contracts and pricing will remain the same. In the next following months, customers can expect to hear more specific details of the combined product portfolio, and hints of new innovation that this acquisition will give life to. In the same breath, Genesys has also introduced CX17 – a combination of both company’s yearly customer experience conference. As one of, if not the, largest acquisition in this space, it will be very curious to watch how Genesys will leverage everything they had to gain from this merger. 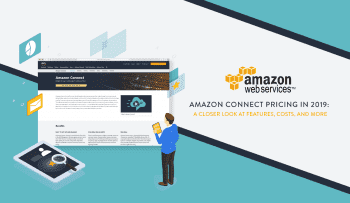 It seems like both were on opposite ends of the spectrum, with Genesys selling to the big names, and Interactive Intelligence offering a full solution to the smaller players. With both sides coming together, we of course will see a massive growth in the Genesys portfolio – but what really matters is how they can take advantage of these new technologies and tools, to grab hold of the market share already relying on what Interactive Intelligence has to offer. In the next few months, we will have to take a closer look at what Genesys brings to the table.